KUWAIT CITY, Feb 7: His Highness the Amir Sheikh Sabah Al-Ahmad Al-Jaber Al-Sabah received at Bayan Palace Tuesday His Highness the Prime Minister Sheikh Jaber Al-Mubarak Al-Hamad Al-Sabah. 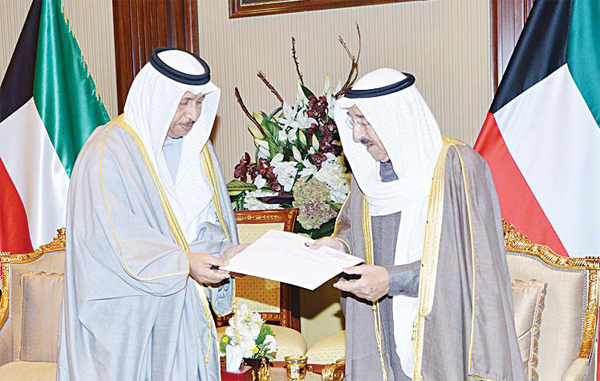 Sheikh Jaber Al-Mubarak presented His Highness the Amir with the resignation papers of Minister of Information and Minister of State for Youth Affairs Sheikh Salman Sabah Al-Salem Al-Humoud Al-Sabah. After the reception, an Amiri decree was issued accepting the resignation of the minister. An Amiri decree was also issued appointing Minister of State for Cabinet Affairs Sheikh Mohammad Al-Abdullah Al-Mubarak Al-Sabah as Minister of Information. An additional decree was issued appointing Minister of Commerce and Industry Khaled Al-Roudan as Minister of State for Youth Affairs. Sheikh Salman stepped down Monday after around 30 deputies of the 50-seat Parliament announced their support for the no-confidence motion filed after opposition MPs grilled the minister last week. Opposition lawmakers, who hold almost half the seats in Parliament, accused Sheikh Salman of failure to lift a 15-month international ban on Kuwaiti sports and charged him of alleged administrative and financial violations. Opposition lawmakers blamed the minister for causing the ban imposed on the country by the International Olympic Committee (IOC), the world football body FIFA and several sports federations. Sheikh Salman, a member of the ruling family, categorically denied the charges, and accused Kuwaitis with senior positions in international sport organisations of orchestrating the suspension. FIFA and IOC imposed the suspension in October 2015, for the second time since 2010, over alleged government meddling in sports. This week’s confidence vote needed the support of just 25 MPs to pass. 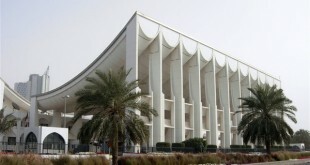 Under Kuwaiti law, approving the noconfidence motion means automatic dismissal. The IOC has demanded that Kuwait amend its sports laws and immediately reinstate the Kuwaiti Olympic Committee, which was dissolved in August, along with several sports federations. It has also urged Kuwait to withdraw all cases it has filed in Swiss courts against international sports bodies challenging the suspension’s legality. National Assembly Speaker Marzouq Al-Ghanim announced Tuesday that the Cabinet has informed him of the official resignation of Sheikh Salman. In a press statement, Al-Ghanim clarified the Parliament will no longer hold the session slated for Wednesday to vote on the no-confidence motion against the minister in view of his resignation. 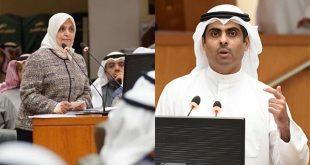 Commenting on the resignation of Sheikh Salman, opposition MP Mohammed Al-Dalal stressed that accepting the minister’s resignation is not enough because the government must lift the suspension on the participation of Kuwait in international sports events considering the former minister did not present any solution. He urged HH the Prime Minister Sheikh Jaber Al-Mubarak Al-Hamad Al-Sabah to be careful in choosing the new information minister and state minister for youth affairs. MP Abdulkareem Al-Kandari said the incoming minister should address all points in the grilling motion against his predecessor. He asserted there was no intention to incite tension or create problems as claimed by some, affirming the grilling of Sheikh Salman is part of the oversight tools given to MPs. Meanwhile, Legislative and Legal Affairs Committee Chairman MP Mohammed Al-Dalal disclosed Tuesday that they approved the request of the Public Prosecution to lift the immunity of MP Ahmed Nabil Al-Fadel in a press misdemeanor case. He added the panel has completed discussions on the Pre-trial Detention Draft Law in the presence of the public prosecutor and representatives of the Justice Ministry. He said some ideas and proposals were presented but talks in this regard were postponed for further study. He went on to say the committee also discussed the bill on appointment to leadership positions with representatives of the Civil Service Commission (CSC). On another issue, Al-Dalal revealed he attended the Financial and Economic Affairs Committee meeting on the gasoline price hike, adding that the economic reform document will be tackled in the next session. He asked the government to suspend any plan to increase the prices of goods and services. He emphasized the need for the government to present a clear vision on cutting public sector expenditures to the Parliament. He pointed out that if the State will regulate spending on irrelevant tenders and special trips among others, there will be no price hike.